We are excited to announce that the 2018 Spring Financial Group Spring Cycle ambassador is Australian former professional road cyclist and triple winner of the Tour de France green jersey sprinter’s classification, Robbie McEwen. Robbie is no stranger to Spring Cycle and can’t wait to hit the ground pedalling with you all in 2018. How did your love affair with cycling begin? I used to love riding my bike through the bush tracks near home when I was a little kid and then I discovered BMX racing. My two brothers and I started BMX racing when I was about nine and from then on I was on my bike at every opportunity. How did you find the transition between BMX racing to road racing? The hardest thing about the transition was building the necessary endurance for road racing. I had to learn to be patient in races and to be conservative with my efforts so I could make it to the finish. Tell us about your most memorable experience in your professional riding career? Racing the Tour de France, winning stages and 3 Green Jerseys are great memories but the one I remember the most is getting selected for my first Tour de France in 1997. I was so excited at the prospect of riding the biggest race in the world and potentially winning a stage. As the race went on I entered the mountains and that’s when I got a big wake up call and realised how how hard it is and what it takes to be successful at the Tour. It was a long three and a half weeks of suffering but it taught me a lot and the experience of riding in to Paris on the final day as a finisher is something I’ll never forget. Robbie living his greatest memory at Tour de France in 2006. Image Supplied. What do you love about Spring Cycle? I love that Spring Cycle gives so many people the opportunity to get out together in so many different ride categories and enjoy a safe day out on the bike. 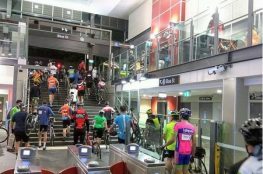 It opens people’s eyes to the riding possibilities in Sydney from the city to Homebush and beyond. 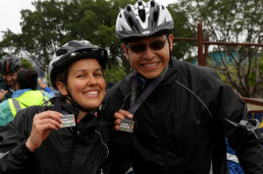 What advice would you give to anyone who is riding the 105km Challenge Ride for the first time? Pace yourself; it’s not a race. Ride at a speed you’d be confident to maintain for four hours. Be sure to take a few breaks along the way at the rest stops, drink plenty of water and electrolytes as well as have a few snacks in your pocket to keep up your energy levels. Robbie McEwen will cycle in the 105km Challenge Ride. Image Supplied. If you could ride with any three sporting legends, dead or alive, who would it be and why? Muhammad Ali - He’d be a whole lot of fun. I’d like to see him float like a butterfly uphill! Usain Bolt - So I could take him on in a two wheeled sprint. Ayrton Senna - I’d like to ride a technical mountain descent with him and watch him translate his driving skills on to the bike. 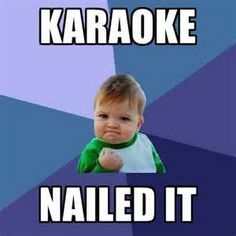 I like karaoke but I’m a terrible singer. Where’s your go-to place to ride and why? Currumbin Valley on the Gold Coast. It’s popular with tourists on the weekends but it’s calm and peaceful during the week which is when I like to ride. It’s a two hour, 60km ride which is enough to keep me fit if I do it three or four times a week. 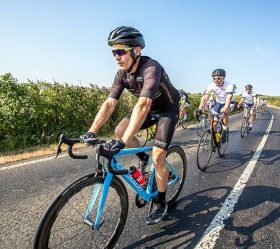 If you weren’t a professional cyclist, what career would you see yourself in? Where is your favourite place to travel and why? South East Asia, the food! If you were stranded on an island what are three things you couldn’t live without? Just one thing - the internet. I don’t have ‘one’ - I take inspiration from many different people for many different reasons. Do you have a good luck charm that you always take riding with you? 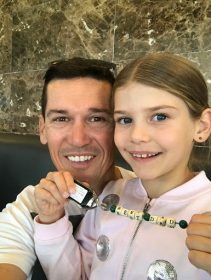 My youngest daughter made me a key ring for father’s day, I carry that. Robbie with his daughter. Image supplied. Robbie will be riding the 105km Challenge Ride. Join him and all the fun on October 14! Enter before midnight Tuesday, October 2 to save $10 on your entry!